Don’t let these insatiable insects make a meal of your trees, shrubs, and turf. Deter them the natural way. 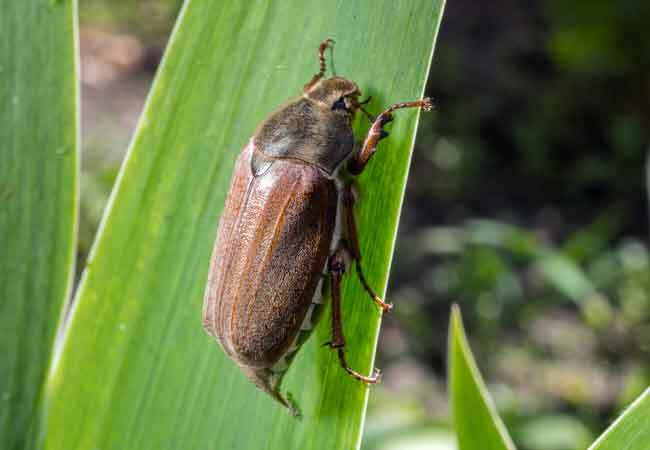 If you’ve ever been out on a summer evening outdoors only to be startled by an inch-long, slow-flying beetle crashing into you, then you’ve encountered a June bug. The four most common of these members of the scarab family are the green iridescent Japanese beetle, the green June beetle, the brown-and-white, ten-lined June beetle, and the brown chafer beetle—and, despite their name, they’re active in adult form from May through July. The way they clumsily flit around can seem kind of comical, but June bugs are no joke to your lawn and garden. As adults, they feast on the leaves of trees and shrubs—roses are a particular favorite—leaving ragged holes in foliage. But their larval form, called a grub, does the most damage. White grubs live in soil and feed off the roots of plants, especially grass. The result is large brown patches of dead lawn that easily separate from the soil in chunks or mats of turf. You’ll typically see the damage during the late summer when the grubs are most active underground. 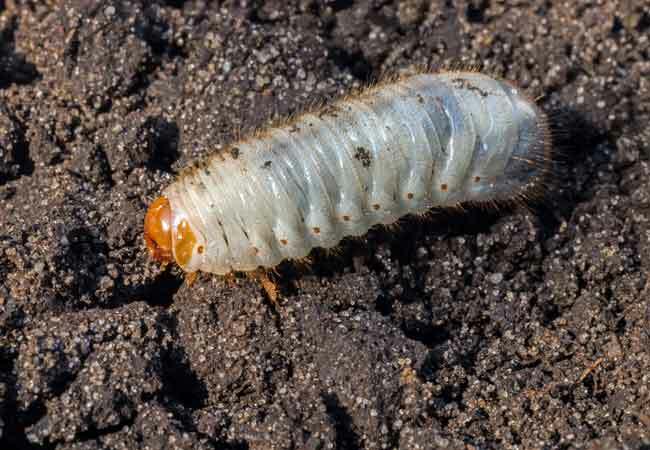 To ensure that June bugs are the culprit, simply lift up a section of dead grass: If you see the slightly curled white grubs in the soil underneath, you know who to blame! Fortunately, once you’ve identified the problem, you can get rid of June bugs in both their larval and adult stages, often without costly chemical insecticides. Female June bugs lay eggs in the grass in mid-summer, so destroying the adults before they get a chance to do so will not only help your shrubs look better this season, you’ll have a head start on a healthier lawn next spring. Set a trap overnight: To attract and effectively drown June bugs, pour one-half cup of molasses into an empty milk jug or large jar, add one-half cup of hot water, then cover and shake well. Bury the open jar near rose bushes or other plants that the little buggers fancy, leaving only the neck of the jar above the soil. Check the trap each morning and dispose of any drowned beetles. Refill the trap as necessary. Catch them by hand: Since these pests generally move slowly, it’s fairly easy to get rid of June bugs by plucking them off shrubs and then drop them into a jar of soapy water to drown them. Be sure to wear gloves when hunting June bugs. Although they don’t bite, some species have sharp spikes on their legs that can scratch. Make a natural insecticide: Kill Japanese beetles and other June bugs with a safe, do-it-yourself insecticide. Mix four cloves of minced garlic with one tablespoon of mineral oil and let sit overnight. Then strain out the garlic bits, add the garlic oil to a pint of water, and mix in one teaspoon of mild liquid dish soap. Put two tablespoons of this concentrate into a pint spray bottle, fill with plain water, and spray directly onto June bugs and any plants showing evidence of their munching. Attract predators: Many insect-eating birds, toads, and snakes enjoy a good meal of June bugs. Encourage these visitors by providing water—a birdbath for birds, a shallow dish of water for toads and snakes—as well as safe spots for your foraging friends to hide when necessary. Birds appreciate the cover of shrubs and trees, while toads and snakes prefer a damp, cool, shady spot to hide in the heat of the day. A terracotta pot slightly tipped up on its side works well as a toad or snake house. Try a commercial insecticide: If natural methods fail, there are insecticides that kill adult June bugs, along with most other destructive garden pests. As these products generally also kill beneficial insects, it’s best to try natural methods before resorting to them. While adult June bugs can wreak havoc with roses and other shrubs during their brief summer fling, it’s the grubs that will get your grass. Lose the larvae with the following methods. Don’t mow too low: Female June bugs like to lay their eggs in short grass, so you can discourage them by not mowing your lawn too short. Keep the grass at least three inches tall during their early-to-mid-summer active season. Let nematodes fight your battle: Beneficial microscopic worms called nematodes attack and kill June bug grubs in your lawn. You can purchase nematodes at most large garden centers. Just mix as directed, spray your affected lawn, and let the worms work their magic. Bring on the bacteria: Bacillus thuringiensis, usually abbreviated as Bt, is bacteria that infects and kills many garden pests, including June bug grubs, yet is harmless to humans and pets. You’ll usually find Bt sold as a liquid concentrate or a powder to spray or sprinkle directly onto affected plants and turf. You might need to reapply Bt weekly if the infestation is heavy. Apply insecticide: If the above methods don’t do the trick to get rid of grubs, there are potent insecticides that will. Many are made from neem oil, which kills many types of larvae but is generally safe for beneficial insects like bees and ladybugs. If a neem-based insecticide fails, there are stronger—but more toxic—pesticides to try. Apply these late in the summer, when the grubs are still close to the surface of the soil. Once winter arrives, the grubs will burrow deep underground, where a pesticide is unlikely to affect them.